It is a 2950 ypp rayon filament loop. I thought to try it with rayon chenille for both size and texture contrast, so I tied a yard of these two yarns onto a section of this warp. 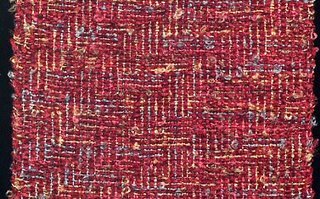 My first sample used a dard red, 1450 ypp rayon chenille, sett at 16 epi. But.......not especially impressive, although encouraging enough to try another sample. So I got out some 1000 ypp rayon chenille in a different color and tried that with the same sett. I quit when several warp threads broke (this is only a sample after all, so I'm not too interested in struggling with the warp just to get a few more inches. ) Plus, it did give me the information I needed. As you can see, the shadow weave pattern is lost at this sett, and possibly not helped by this color combination. Neither sample motivates me to try another. In fact, I'm already beginning to switch gears, mentally. 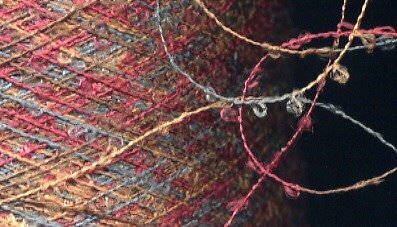 The Online Guild will be offering a lace weaving workshop in November and I would like to participate in that. So perhaps its a good time to clean off the loom, do a little vacuuming, put away my odds & ends, and tidy up my stash a bit. Even so, I can't say that the weekend was a waste, weaving-wise. I'm just glad I decided to do the samples instead of throwing all caution to the wind and warping the loom for an entire project! Now see the one that worked by clicking here. I see what you mean, it loses the effect somewhat. It might have been better if the rayon loopy was a single colour...hard to tell. I agree, if the loopy rayon was a solid color it probably would have shown more. But it still produced a nice fabric with little touches of color here and there. 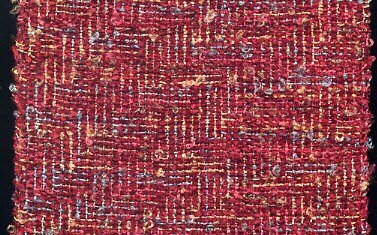 Almost like a boucle fabric. No sample is ever wasted as long as you learn something from it. It is hard to figure out the best use for those novelty yarns, isn't it? I have some space dyed merino/silk in my stash for >12 yrs. waiting for the right idea to come along. It's a nice little yarn, though. I'm sure you'll find something interesting to do with it. What do you think a more open weave would look like? You were smart to sample first. Have fun with your lace weaving! I love yarns like this, but, as others have pointed out, it is difficult to know how to use them. I suspect this is a yarn where you forget shadow weave (you've tried it, after all) and try a lot of different structures, perhaps experimenting with sett as well. What a great lookiing yarn. It looks like it would be perfect for using as a supplementary warp -- that way you could use it for some dramatic accents without having the stress of having it fully beamed. Another bonus, is that way you only have to use each strand at a length that matches the current project instead of an entire warp's length. As creative as you are, I know you will come up with just the right use for this great looking fiber. Ya just gotta love making samples first. 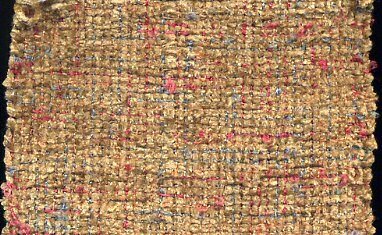 I have a crazy rayon chenille question. How much does that stuff shrink? Is it 10% or more like 15%?